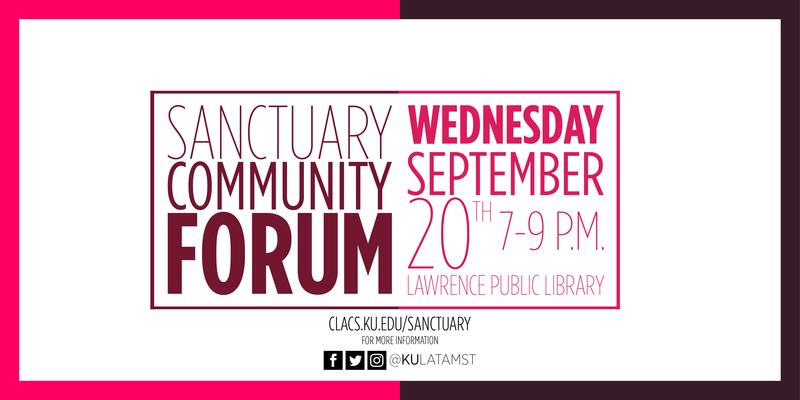 The Center for Latin American and Caribbean Studies at the University of Kansas is hosting a community-wide conversation about sanctuary at the Lawrence Public Library on Wednesday, September 20 from 7-9 PM. In the past several years, immigration enforcement has at times given rise to sanctuary cities, sanctuary campuses, and other grass-roots sanctuary movements and efforts. This event will offer our community the opportunity to have a conversation about the history and meanings of sanctuary. The forum will begin with panelists discussing sanctuary efforts and movements past and present, and what sanctuary means today. Audience members are invited to join the discussion. Supported by the KU Center for Latin American and Caribbean Studies, Latinx Studies Initiative, Latin American Graduate Organization, Latin American Student Union, Office of Vice Provost of Diversity and Equity, Institute of Haitian Studies, Office of International Programs, African and African American Studies, Kansas African Studies Center, Department of American Studies, Department of Spanish and Portuguese, Center for Migration Research, and Lawrence Public Library. For more information, contact Aron Muci at 785-864-4213 or aron.muci@ku.edu. *Unfortunately, this event coincides with the first night of Rosh Hashanah, an oversight we regret. We want to recognize that the Jewish community has deep roots with sanctuary movements and we are disappointed that many people will not be able to attend because of the overlap with the holiday. We apologize for our error.